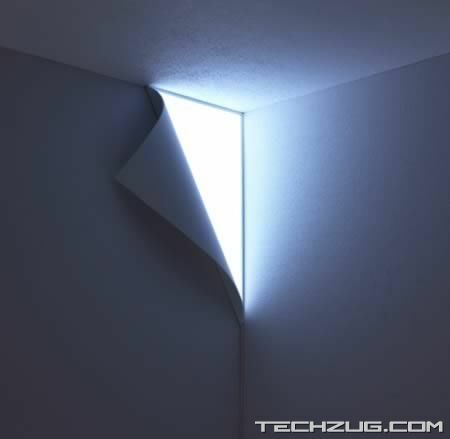 This wall light actually looks like it’s peeling away from the wall. Which is probably (duh) why they call it the Peel Light. Now before you start clearing a corner in your room for this, you might want to get out $900 to pay for it. Maybe you have that much stashed behind a wall, in which case – perfect synergy – bravo! French born Nicola L. (that’s right, just an L. for the last name) is a conceptual artist who creates everything including performances, films and functional art. 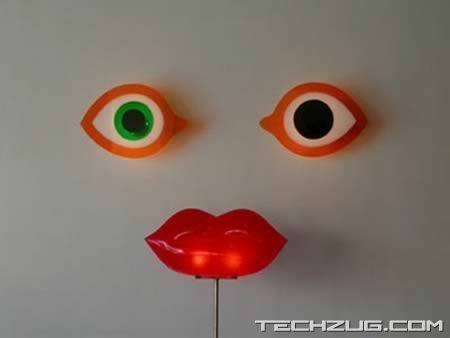 Having had a hugely prolific career for over five decades, she has shown in many galleries and has a clear affinity for heads, eyes and snails, as you can see from these amazing Plexi wall-light eyes and floor lamp lips. 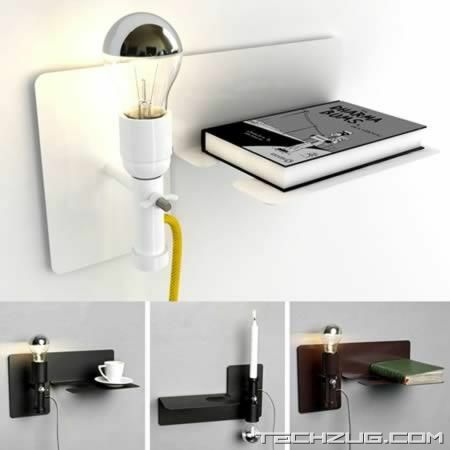 Produced by Norway’s Northern Lighting, “Sunday” is a wall light and shelf combined. It’s lit by using either a bulb or a candle. This petite design object was created by Martina Carpelan of Studio Frost Produkt after being invited by the Norwegian design magazine Design Interior, to create a lamp within the time frame of a week. Sunday may be used a bedside table or in the hallway, in a chalet or in the toilet – or actually anywhere you may need a light and a shelf combined. Vary the mood by simply turning the socket and re-lock it! The perfect mood maker for a Sunday morning in bed. 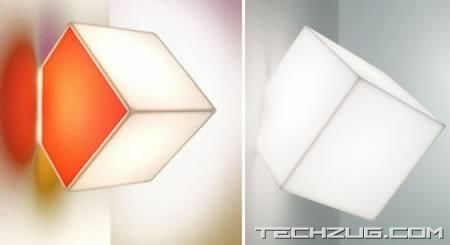 A quirky light fixture that, when fitted to the wall or ceiling, resembles an illuminated cube with one corner embedded in the surface of the plaster. 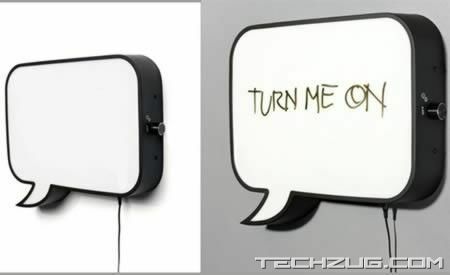 This light is suitable for both indoor and outdoor use. 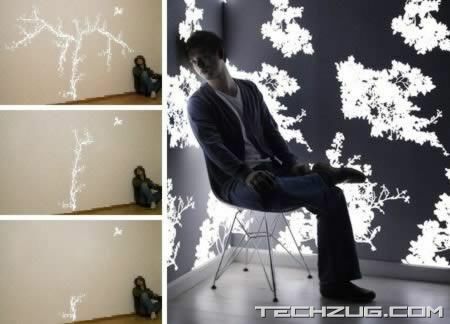 This light-emitting wallpaper owes its appealing luminescence to light-emitting diodes (LEDs) embedded in the wall covering. Tiny, thin and cool, LEDs allow wallpaper designers like Jonas Samson of The Netherlands, to create innovative wallpapers that double as light sources  they can even be adjusted to provide as much light as needed or desired. Plenilune, crescent or any kind of moon all belong to you if you wish. 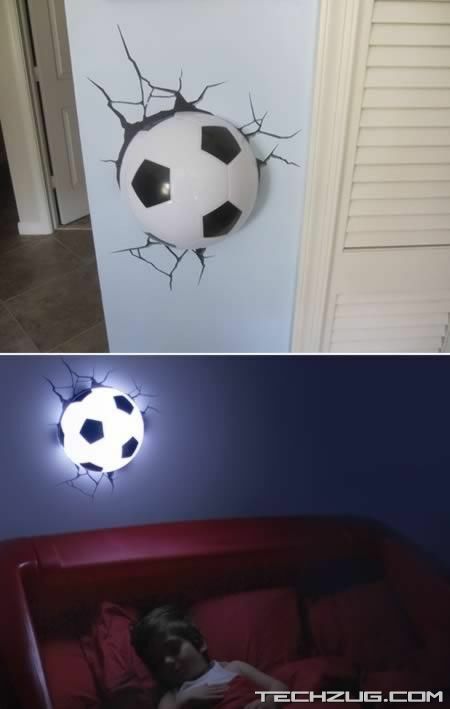 Just mount it on the wall and Bingo! you’ve got your own moon. 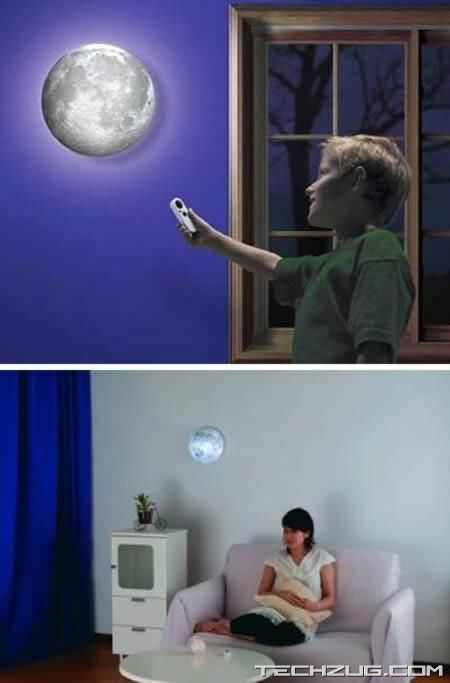 You can also control its brightness. 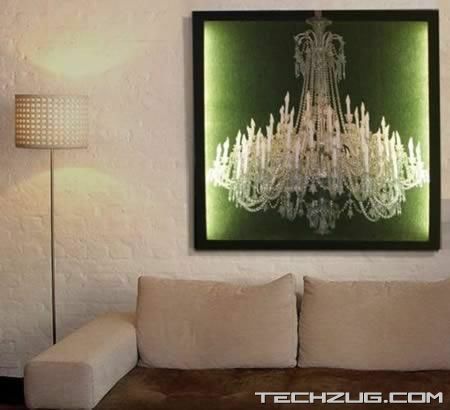 Create a “wow” moment for your guests by hanging up the Crystal Chandelier on Green Wall Light by Duffy London, a.k.a. Chris Duffya young, cool, hipster of the London design field, who executes fantastically simple ideas with the greatest of style. Part baroque and part minimalist equals a 21st century style in the form of faux chandelier lighting. The green light shines through the digitally printed canvas creating a formal atmosphere charged with modern humor. Wiring includes a plug with an 8-ft cord. 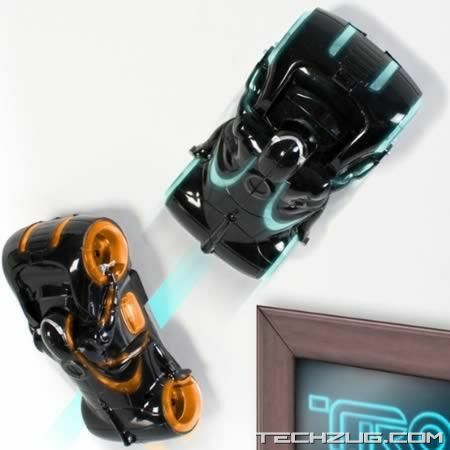 The TRON Wall Climbing R/C Light Cycle defies gravity and climbs both walls and ceilings. Better still, just like the bikes in the movie, Zero G Light Cycles emit trails of light (or jetwalls) that will cause your opponent’s vehicle to fall off the wall or ceiling if crossed. You control the high-tech action via a stylish twin toggle infra-red transmitter that doubles as a charging unit for your Light Cycle’s rechargeable battery. It’s even badged up with the iconic Tron logo. The Tron Zero G Light Cycle measures approximately 12cm (L) x 5.5cm (W) x 4cm (H) and uses 6 AA batteries. The product is sold at Firebox.com for £34.99 (about $55 USD).